Evaporation ponds or retention ponds exist at in situ leach (ISL) uranium mining operations for the collection of wastewaters. 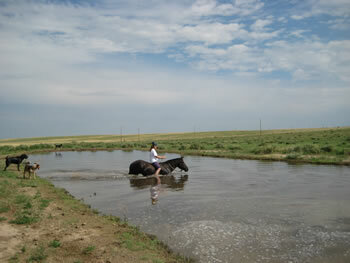 Evaporation ponds are designed to keep toxic pond sediments contained and submersed at all times. 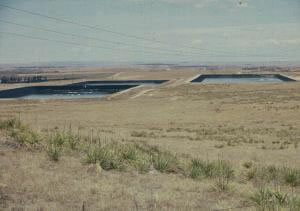 Evaporation ponds at Crowe Butte Uranium ISL mine, near Chadron Nebraska, estimated to be larger than three football fields each. Photo courtesy of Buffalo Bruce. Air quality near mining wastewater retention ponds is of concern. On December 18, 2008 a Moab Times article announced Utah’s Grand County Council passed a “groundbreaking” ordinance to protect the county’s air quality. Craig Bigler reported, “The ordinance sets standards for permitting and monitoring evaporation pond facilities for the disposal of produced water from oil and gas wells.” While Bigler specified oil and gas evaporation ponds as the target of this ordinance (http://www.grandcountyutah.net/pdf/bc/Ordinances/ord_476.pdf), the same concerns exist with uranium mining evaporation ponds: nearness to existing residences, irrigated farm lands, or intermittent streams; ground water depth, flow rates, and direction of flow; and wind patterns at the evaporation pond site. Uranium mining evaporation ponds have one added hazard: the presence of radioactive isotopes. During uranium exploration and mining, huge quantities of radon gas are also released into the air, and dissolved in surface waters. The US Surgeon General has determined that radon is the second leading cause of lung cancer after cigarette smoking; tens of thousands of Americans die every year from exposure to radon gas. The areas of Weld and Larimer Counties nearest Powertech’s proposed uranium mine are familiar with wind. In his book, Colorado Weather Almanac, Meteorologist Mike Nelsen characterizes Colorado as being notorious for its wild winter winds. “Seasonally, hurricane force winds blow across the Front Range of the Rocky Mountains, and wind speeds approaching 150 mph- equivalent to a category 4 hurricane – have been measured at the National Center for Atmospheric Research in Boulder” (Colorado Weather Almanac, Page 65). Colorado’s wind season begins mid-November and lasts until mid-April when it blows into thunderstorm season. Thunderstorm season has earned Weld County the title of tornado capital of America. Severe storms have damaged mining ponds. Winds have caused ponds to overtop when conditions exceeded the pond design’s wind rating, earth quakes can damage the pond, and mining ponds have overflowed in unusually heavy rainfall. Click here to see a map of wind directions from Powertech’s proposed uranium mine area. In June 2007 a thunderstorm’s runoff from the flattop mesa where Powertech proposes to mine uranium filled this pond on Jay and Robin Davis’ property. Flooding of the pond is a yearly occurrence and, by late September, the pond has typically dried up. The area of Powertech’s proposed uranium mine near Nunn has a history of heavy rains and flooding. To see a photo gallery of recent storms click here.